After discovering a frozen body of an Italian fencing master in the Thames, London architect Christopher Redmayne and his friend Constable Jonathan Bale must prove that Redmayne's own brother isn't the killer. 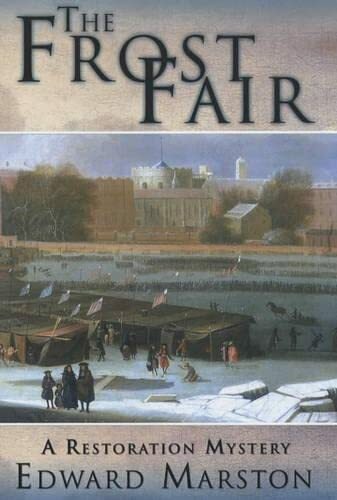 Rather than exacerbating that winter's gloom, a sudden freezing-over of London's Thames River in 1669 becomes a cause of public delight in Edward Marston's The Frost Fair. "In place of a river, we have the widest street in Europe," exclaims architect Christopher Redmayne, as he observes the myriad merchants and entertainers who've mounted an eccentric celebration on the ice. But this revelry soon cools, after Redmayne and his sober-sided associate, Constable Jonathan Bale, discover a corpse trapped in the glacial crust. The deceased is Jeronimo Maldini, an Italian fencing master who was stabbed with a dagger belonging to none other than Redmayne's foppish, pleasure-seeking elder brother, Henry. Though once friendly, those two gents evolved into bitter foes, and Henry had rashly threatened to slay the duelist. Most Londoners, including Bale, are convinced of Henry's guilt, and the accused was too inebriated on the night of the murder to be sure of his own innocence. Christopher, however, is sure, and so sets off to find the real killer--an errand that will find him nearly drowned in the Thames and crossing swords with a "hero" of dubious acclaim. Meanwhile, the designer detective must fend off the amorous advances of a new client and, not insignificantly, prevent Henry's suicide in squalid Newgate Prison.